The Yellow River, China's "mother river" known for thousands of years for its heavy concentrations of silt and sediment, is reported to have become permanently clear in some stretches. A rarity in history, the recent phenomenon has aroused fierce discussions and debates between environmentalists and ecologists. A recent report from Outlook Weekly magazine revealed that the Yellow River has become gradually clear, with dwindling sediment concentrations, starting in the year 2000. The river is now clean in the 1200-kilometer middle portion of the river, between Hohhot, Inner Mongolia Autonomous Region, and Taohuayu, Henan Province, which is the cut-off point between midstream and downstream. It means that, together with the clear upstream, 80 percent stretches of the river are now totally clear in non-flood seasons. Throughout history, there have only been 43 reported instances of the Yellow River becoming clear. And yet, this clarity never lasted more than 20 days. The new phenomenon, which has lasted for years, is the longest duration in its history. This, of course, has excited experts, as it is considered the successful result of several generations worth of consistent efforts in "harnessing" the river, be it vegetation conservation or controlling silt and sediment, which can be traced back to 1946. But considering the environmental significance of the Yellow River, the difficulty in taming it and the potential dangers it still poses, there is no definitive consensus about whether this new clarity is a good or bad thing. Experts have reached a general consensus regarding the reasons for the new clarity, but they still hold different views as to how it will affect the environment in and around the river and other possible risks. Compared with the 43 other times that the Yellow River has become clear, experts agree that those were probably accidental. Today's clarity is something altogether different and dramatic. Zheng Xiaoyun, an expert in water history from Yunnan Academy of Social Sciences, confirmed with China Newsweek magazine that any clearness in the past was due to natural causes. "A long period of drought would reduce water flow and thus the vigor to carry sediment decreased, which in the past caused the sediment to settle and the water to become clean," said Zheng. 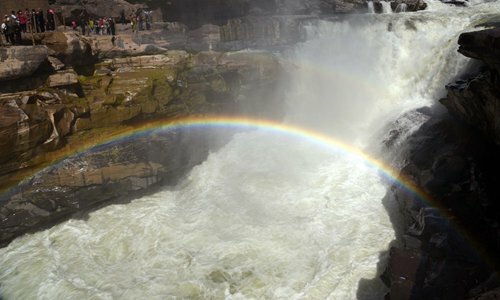 But the Yellow River's new-found clarity is being attributed to China's ongoing efforts to conserve soil and water and the widespread use of reservoirs, experts have analyzed. For centuries if not millennia, the Yellow River carried 1.6 billion tons of sand on average every year. But between 2000 and 2015, the number suddenly dropped to 264 million. The upstream conservation of soil and water along the Loess Plateau played a significant role in this. According to Chen Xiande, former vice director for the Yellow River Conservancy Commission of the Ministry of Water Resources, the conservation of soil and water was difficult in the past because people continued to damage vegetation (for cultivation purposes) as part of their livelihood. As Chen revealed, after China's reform and opening up, the government increased investment and helped relieve the financial pressure of local farmers. This directly contributed to the plateau's soil and water conservation achievements. Zheng said that, besides forestry planting and vegetation recovery, the large-scale development of silt-precipitation dams and other such facilities have also been effective in preventing water and soil loss upstream. Statistics show that, during the past 20 years, conservation efforts in the plateau have prevented 435 million tons of sand from flowing into the Yellow River every year. But experts have also found that conservation efforts and water conservancy facilities are far from enough to explain the recent rapid drop in sediment. Li Wenjia, former chief engineer for the Yellow River Conservancy Commission (YRCC), believes that the reduction in sediment is also related to sand excavation. Many reaches of the river, for instance, have become sandpits due to rapid urbanization in areas along the middle of the river. The consequent infrastructure construction and real estate projects have spurred a wave of sand excavation. Experts from the Yellow River Engineering Consulting Company estimate that, every year, approximately 100 million tons of sand along the Yellow River is excavated in this way, reports Outlook Weekly. 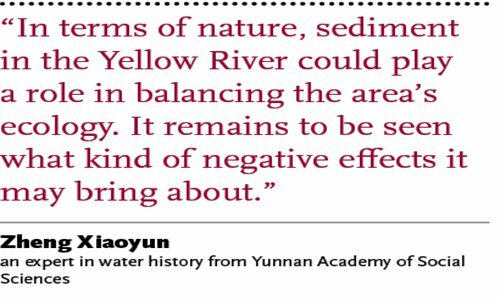 According to Zheng, who used to work at YRCC, both advantage and disadvantage exist in the Yellow River's reduced sediment and its new clarity. He regards the clearness of the river as a generally good sign that the environment is improving, reflecting China's achievements in taming the river. Meanwhile, he said sediment in the Yellow River should find a balance with nature rather than with humans. 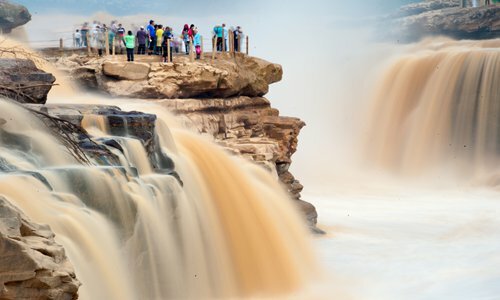 In the tens of thousands of years that the Yellow River has existed, the flora and fauna along the river have organically developed their own unique ecological balance with the sediment that runs through it. Zheng explained that a reduction in sediment inevitably will harm this balance. He said the sediment could expand land surface and cover the kaline soil, which harms plants. Fish species such as the carp have also adapted to the river's muddy environment; becoming clear could impact their survival. "In terms of nature, sediment in the Yellow River could play a role in balancing the area's ecology. It remains to be seen what kind of negative effects it may bring about," Zheng told China Newsweek. There is also disagreement over how long the Yellow River will stay clear. Qi Pu, who used to be an engineer for the YRCC, believes it will become a trend for the Yellow River to become clear now that sand flow has been dwindling year on year. But according to Li Wenjia, as the Loess Plateau keeps producing sediment, the river will return to its previous silty state sooner or later. "Sand sediment could increase to 800 million tons at most, despite all the new water and soil conservation measures," said Li. In spite of its new-found clarity, it remains a Sword-of Damocles-like existence in the view of many experts. Many voices are cautioning that the new clearness of the Yellow River may cause even more disastrous floods and other possible negative results. In July 2013, high-intensity rainfall in the Fenchuan stretch of the Yellow River caused big floods in that area. At the time, there were six instances of heavy rainfall in the area; due to the area's lush flora, the rain was at first trapped in the vegetation, but then finally ripped through all at once, causing flash flooding. Zhang Jinliang, CEO of Yellow River Engineering Consulting Company, said the Fenchuan flood was nature's warning that water and soil conservation measures work only under certain levels of rainfall. Once the rainfall surpasses a certain level, there will be more water and soil erosion. Zhang added that for dams that are designed to prevent sand flow, sand accumulates in the dam when the rainfall is within a certain level. But once rainfall surpasses that level, all the accumulated sand, including in the dams, will return to the river again. Some also say that the new, clear water may also create big risks in future flood control. In the past, when sediment was intense during a flood, the water flowed on one side and the sand settled on the other. This formed a stable course. But clear water, which washes out both sides, could lead to changes in its course and cause unexpected damage. The Yellow River itself is, by nature, calamitous. Throughout the history of Chinese civilization, people living in its vicinity have fought against the floods it often brings. From 602 BC to 1938 (over 2500 years), 543 of those years witnessed regular flooding along the river. Its dykes have been breached 1590 times and the river has changed its courses 29 times. As Outlook Weekly reports, the Yellow River Conservancy Commission once estimated that there would be possible flooding downstream at 55,000 square meters per second. But others claim this threat is being sensationalized. Chen Xiande said that, once sand settles down, it is hard to make changes in its course simply by being washed up; it is also uncommon to stir up settled sediment.